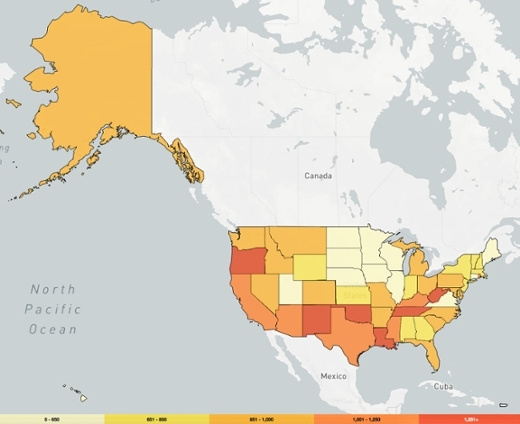 HepVu launched new interactive maps illustrating state-level estimates of people living with hepatitis C across the United States. The maps highlight a concentration of infections in some states most impacted by the opioid epidemic. Published in JAMA Network Open, the data reveal an estimated 2.3 million people living with hepatitis C infection in the U.S. between 2013 and 2016, with a high burden in the West and in some Appalachian states. “We still have more than 2 million people living with hepatitis C at a time when ending this epidemic is possible,” says Patrick Sullivan, PhD, DVM, professor of epidemiology at Emory University’s Rollins School of Public Health and principal scientist for AIDSVu. Three-fourths of Americans living with hepatitis C are Baby Boomers (those born between 1945 and 1965). However, the largest increases in hepatitis C infections over the last decade have been among individuals less than 40 years old and particularly among persons who inject drugs. The Western U.S. has the highest rate of people with evidence of hepatitis C infection, with 10 of the region’s 13 states having an estimated hepatitis C prevalence above the national average. There is also a concentration of hepatitis C in Appalachia, likely related to the opioid epidemic in these states. Kentucky, West Virginia, and Tennessee are now among the 10 hardest-hit states. Nine states (California, Florida, Michigan, New York, North Carolina, Ohio, Pennsylvania, Tennessee and Texas) represent more than half, or 52 percent of all persons with hepatitis C nationally – and five of the nine states are in Appalachia. HepVu is a Powered By AIDSVu project presented by Emory University’s Rollins School of Public Health in partnership with Gilead Sciences, Inc. State-level hepatitis C prevalence estimates on HepVu can be viewed alongside social determinants of health and data related to the opioid epidemic, including opioid prescription rate, narcotic overdose mortality rate and pain reliever misuse prevalence. HepVu also visualizes data on hepatitis C-related mortality (2016) obtained from the Centers for Disease Control and Prevention’s (CDC) WONDER Online Database System. Additionally, HepVu offers downloadable datasets for researchers and health departments to utilize in their own analyses, infographics on hepatitis B and C, and state-specific factsheets. The state-level hepatitis C prevalence estimates displayed on HepVu are produced by the Emory University Coalition for Applied Modeling for Prevention (CAMP) project with researchers from the University of Albany and developed with CDC. Findings were published in the peer-reviewed Journal of the American Medical Association (JAMA) Network Open in an article titled, “Prevalence of Hepatitis C Virus Infection, US States and District of Columbia, 2013 – 2016”. The new data are derived using an updated approach to the previously published methodology for 2010 state-specific hepatitis C prevalence estimation that reflects current changes to the epidemic. To estimate state-level hepatitis C prevalence, researchers analyzed blood test results from the nationally representative National Health and Nutrition Examination Survey (NHANES) and vital statistics data from 2013 through 2016, and incorporated data on hepatitis C-related deaths and narcotic overdose deaths. The researchers also estimated the number of hepatitis C infections among populations not included in NHANES, including incarcerated, unsheltered homeless, and nursing home resident populations. For more information on the data methods, please visit HepVu.org. HepVu is an interactive online resource that visualizes data on the U.S. hepatitis C epidemic to increase awareness of viral hepatitis and inform public health decision-making. HepVu is a Powered By AIDSVu project presented by Emory University’s Rollins School of Public Health in partnership with Gilead Sciences, Inc.
Emory University is known for its demanding academics, outstanding undergraduate experience, highly ranked professional schools and state-of-the-art research facilities. Emory encompasses nine academic divisions as well as the Michael C. Carlos Museum, The Carter Center, the Yerkes National Primate Research Center and Emory Healthcare, Georgia’s most comprehensive health care system. A comprehensive public research university, the University at Albany-SUNY offers more than 120 undergraduate majors and minors and 125 master's, doctoral, and graduate certificate programs. UAlbany is a leader among all New York State colleges and universities in such diverse fields as atmospheric and environmental sciences, public health, business, criminal justice, emergency preparedness, engineering and applied sciences, informatics, public administration, social welfare, and sociology taught by an extensive roster of faculty experts. It also offers expanded academic and research opportunities for students through an affiliation with Albany Law School. With a curriculum enhanced by 600 study-abroad opportunities, UAlbany launches great careers.